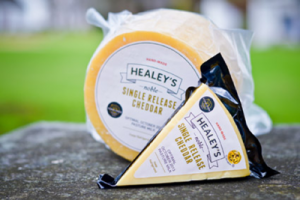 The saying ‘spring is the best time to be single’ certainly rings true when it comes to Healey’s Slow Matured Cheddar as we have just unveiled the latest vintage of our exclusive Single Release Cheddar. A limited release, handmade cheddar produced from the finest unpasteurized milk back in spring 2016, when the pastures were at their optimal. Annually there is a three week window period when the meadow is truly lush and rich. The milk during this period is exceptional and this forms the base for our world-acclaimed Healey’s Single Release Cheddar. This latest rendition was produced with minimal interference from premium raw milk of happy cows grazing on a mixture of kukuyu and clover and then naturally aged for a minimum of 11 months. “This is by all accounts the finest Single Release we have produced to date and we cannot wait to share it with our avid Healey’s fans, right here in the heart of our deli,” shares Desiree Stuart who heads up our small cheese making team. This royal cheese can only be purchased from our Healey’s Cheesery and Deli, situated at the foot of the Waterkloof Estate outside Somerset West and don’t wait until the cows come home as there is only 200kg available. It sells for R75 per 200g wedge. If this is not enough reason to visit our deli, why not come and try our famous cakes, the best coffee in the Helderberg, biltong, locally sourced condiments, fresh bread, some delicious charcuterie and cheese platters, light meals, Mad Giant craft beer and the full range of Waterkloof wines which you can also take home. Our deck overlooking False Bay is the perfect spot to enjoy your slice of Healey’s heaven so bring the kids along; they can monkey around on the jungle gym while you nibble on some fine artisanal fare. We’re open from 10h00 until 17h00, Monday to Saturday, and from 10h00 until 14h00 on Sunday. Hope to see you soon!